My name is Valerie Wilson and I am just a normal girl who loves to do nail art. I have only been doing nail art for less than a year and only my own nails and sometimes one of my girlfriends nails. I have no formal training in nail art or have taken any art classes. This is my hobby and I just practice, practice, practice!!! Please follow me on Google+ or Facebook for all my new designs and updates. I was thrilled when Priyanjana asked me if I would do a guest post on her blog. I thought what a perfect time to give you guys some tips and tricks that I have learned along my nail art learning journey. My first tip would be to use Acrylic paints for your art. I like to use acrylic paints for a few reasons. I find they can be easier to work with than nail polish and can be easily thinned out with just a drop of water if they are too thick. They are very inexpensive, (I buy mine from walmart for $.56 cents each). When I first started out I bought all the colors of the rainbow (red, orange, yellow, green, purple, and black and white) They cost me about $5 total and I can make any shade of color just by mixing them. And my favorite and the best part about using acrylic paints is if you mess up a design, you can use alcohol to remove the design and start over WITHOUT ruining you base polish. When you are happy with your design, a clear top coat will seal in your design. I use a plastic top from a butter container as a palate for my acrylic paints, but a pie plate or a ziplock baggie or anything you have around the house will work even a piece of paper folded, at least in half, so it doesn’t bleed through and make a mess of your table will work. Nail art tools can be anything you have around the house. Toothpicks, bobby pins, a pen or pencil make great dotting tools. Makeup brushes make great nail art brushes too, don’t be afraid to cut any brush to make them smaller and/or thinner to get the desired size. Have an old liquid eyeliner that has dried up and that are gonna toss…. Wash the brush, it makes a great detail brush. You can make a striper brush by cutting an old polish brush, just remember to save and wash out the bottle so you can put it back in the bottle when dry to protect your precious bristles so they stay straight. And lastly, Try to have all your supplies on the table and ready to go. I always include a few cotton balls, q-tips, a paper towel or napkin and a small shallow container of water and your Acetone or nail polish remover (I usually pour some in the cap so its there and ready for me to use) to rinse my brush and also for cleanup. 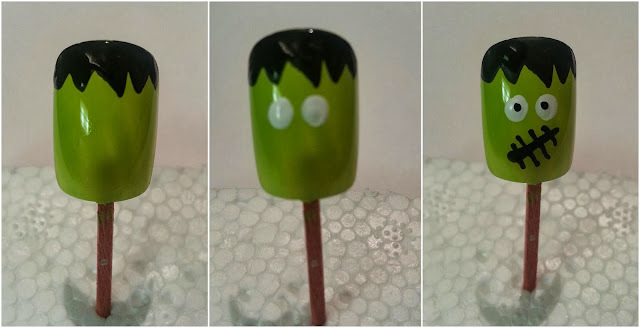 Since Halloween is right around the corner - Here are some Halloween designs that are super simple to do. You don’t need any special nail art tools for any of these designs. All I used for these designs is just a toothpick. I did a step by step photo strip of each design to make it easier for you to see how I created them. Have fun!!! All the designs designs were done with just a single base color polish and acrylic paint for the art EXCEPT the Candy Corn. The Candy Corn was done using 3 different color polishes layered as shown. hey thanks , Bushra ! All credit goes to Valerie! And just in time for Halloween! I think we should also celebrate this day a little ! Thanks everyone. I'm glad you're enjoying them. And thanks priyanjana for inviting me to guest post for you! Thank a lot Valerie ! and you are always welcome! My pleasure! 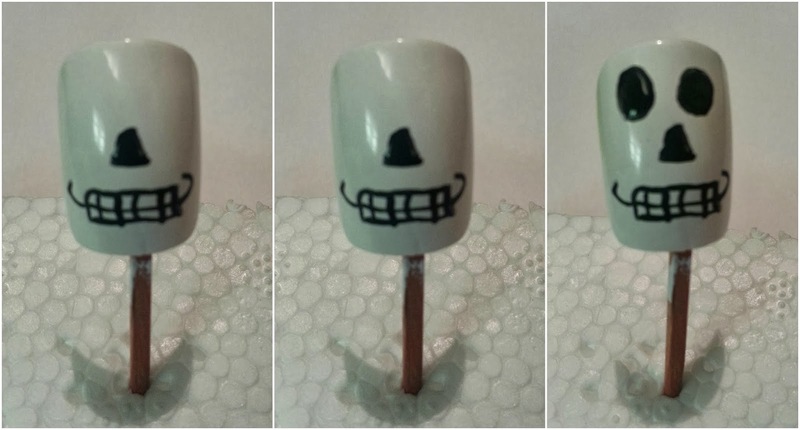 This nail art tutorial is really too good. Whether it is available in online or not?